Thanks for all of your generous responses to my last post. The artist-blogger community never fails to surge forward with kindness after a troubling event, or a trying time, and I’m incredibly grateful for this virtual, palpably good community. You set the bar for civility and encouragement, and I’ll do my best to reach that watermark in an attempt to pay it forward. Art Festival attendance is down – from both participating artists and attendees, and some festival organizers have closed up shop altogether. For over a decade, I’ve visited with patrons, friends and family at upcoming art festivals here in Southern California. As of this Spring, several art festivals have gone the way of many galleries, and tossed in the towel. If you’ve visited the Thousand Oaks Artwalk in June, or the Thousand Oaks Arts Festival in September, we will have to hang out somewhere else, because they’ve closed down. To balance the absence of those two venues, I’ll be launching a sale in my Etsy Shop soon. Stay tuned for more details in upcoming posts. Trace Monotype with no press: printmaking ink is rolled onto a smooth surface. Printmaking paper laid on the ink, and the artist applies varied mark-making on the back of the paper to pick up sketchy, lovely ink lines on the front & voila: a trace monotype! I’ve been sneakily making art whenever I can, even at the expense of other things on my To-Do list. (Shhhh, don’t tell anyone.) I’m drawing at the kitchen counter while munching salad, making notes about art projects while replying to emails, and gridding-out drawings for future watercolors on the couch while my husband and I relax together after dinner. I made this trace monotype awhile ago, and it’s been pinned to my art-board in the studio, whispering at me to finish her. Since the reference photo was taken in the late 1950’s of my mother in law, the urge to work on the monotype was strong this week. I laid the first washes of watercolor on the paper while making phone calls, and added wispy lines of colored pencil to her hair on the couch in the evening. See the work in process shots below. In printmaking, a monotype plate is featureless. The surface is absent of texture (such as engraved lines) that will affect the characteristics of the print. All imagery in monotypes are reliant on the artist manipulating pigments, resulting in one distinctive print. There is no repeatable element on the plate’s surface that would be visible if you inked the plate and pulled another print. The word mono refers to one; you get one monotype from the plate if you ink and print from it. A monoprint refers to a plate with engraved lines, adhered materials or texture that is part of the plate’s surface, and it’s therefore repeatable on each print. Variations result when the artist inks the plate with different colors and additional mark-making, but when they pull the print, the textures integral to the plate will be visible with each variation of the monoprint. Inky trace monotype on kozo mulberry paper – simplified mark-making is an “underpainting” staged as a leaping off point towards other media. Mulberry paper, also known as kozo, is a very light, sometimes transparent printmaking paper that’s also very tough. It’s usually made with no sizing (starch or gelatin) from the innermost fibers of the mulberry tree, and it’s been used in printmaking for centuries. Mulberry is sold in plain sheets, or with decorative, organic elements embedded into the fibers, like this kozo paper with bamboo leaves. 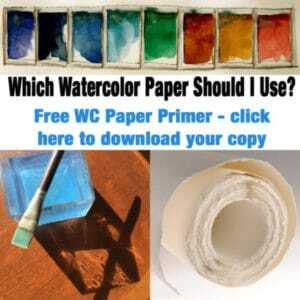 Painting with water media on unsized paper is like painting on a paper towel. 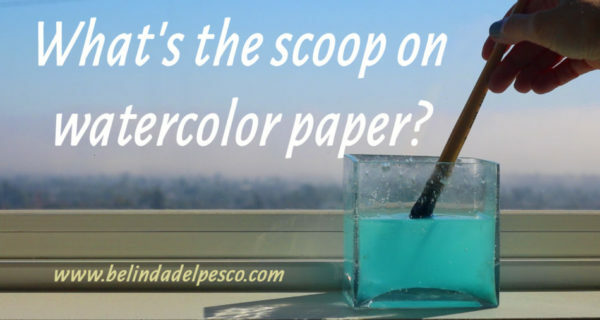 The pigments absorb & travel, willy-nilly in all directions, and color sinks all the way to the back of the paper. You have better success controlling watercolor meanderings on unsized paper with thin, dry-ish glazes, more akin to the viscosity of printmaking inks. I worked slowly on this trace monotype, applying pigment gently, and waiting for each application to spread & dry before adding more layers. What is a Trace Monotype? If you’re new to the method of trace monotype, here is one of three tutorial videos from my demonstration channel on youtube (below). If you’re looking for supplies, each video has a Show More section that can be clicked to open a list with links to all the goodies you’ll need to make one of these monotypes on your kitchen table. You don’t need a press to make a trace monotype. Happy printing! Trace monotype is also used on fabric, and mixed media art to great affect. Here is a twenty five minute tutorial video that demonstrates printing from a sheet of plexiglass on hand died fabric (the same process works on paper) with basic supplies and no press. Laura Kemshall is articulate & encouraging in her demo, so give it a look-see and get your art supplies ready for some after-dinner printmaking sitting on pillows at a coffee table! Thanks for stopping by today, and have a creative week. I’ll see you in the next post! I’m sorry to hear that about the shows. I did the Conejo Valley one in the bank parking lot, but not the other Thousand Oaks one in the hilly area. Attendance seems to have slowed overall. I enjoy seeing your process and beautiful work, as always.